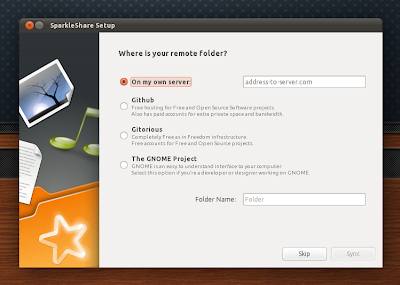 Sparkleshare is an open source tool to synchronize your files in the cloud and it can use a GitHub, Gitorious or your own private GIT server. 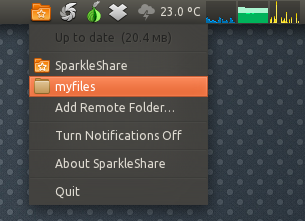 For now, SparkleShare is easy to install under Linux and Mac, "but it’s hard to get running and it doesn’t integrate well with the system" on Windows, says Hylke, the SparkleShare developer. Android and iPhone clients might be released in the future too. The first stable Sparkleshare version (0.2) was released earlier this month, getting a pluggable backend and experimental Mercurial support. This means it might get support for other protocols in the future, like SFTP, etc. Added support for Growl to show notifications on Mac. Removed the dependency on GitSharp. File rename detection support in the event logs. Fixed all crashes reported in RC1 and improved sync algorithm. Redid collision detection and conflict resolving (use a copy of each version). Improved about dialogs with version checking. The "mkdir -p ~/.ssh" command is required because if the ~/.ssh folder doesn't exist, SparkleShare crashes. Once you install this package (for some reason, it's not automatically installed by SparkleShare), you can get previous versions of a file or copy its web link. Unfortunately, at least in Natty, the sync status file emblems are not displayed (and I've tested it on two Natty computers). 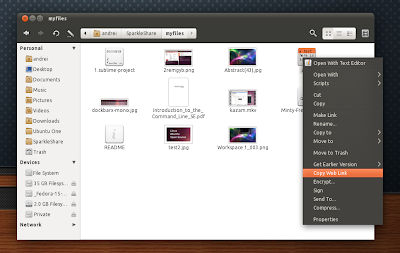 This stable SparkleShare PPA doesn't provide an AppIndicator for Ubuntu. But there's a daily builds PPA "ppa:terminus/ppa" from which you can install SparkleShare with AppIndicator support (but remember, this PPA is unstable!). After an update, the stable SparkleShare PPA provides an AppIndicator too. For Mac binaries and source files, see the SparkleShare homepage. Also see: how to encrypt files before syncing in SparkleShare (for an easier way, you can use EncFS like in this post). New via SparkleShare blog and Synancy @ Twitter.